On February 23rd, members met at the Lone Pine Marsh – Braham tract for a winter walk. It was sunny and not too cold so it made for an excellent day for a walk. Members look out on the marsh at Lone Pine Marsh. We heard bluebirds and cardinals from the parking lot while waiting for everyone to arrive. Creek at Lone Pine Marsh in winter. The snow was very crunchy on top due to a thaw the previous day, followed by cool overnight temperatures. This made discerning tracks challenging. We saw caanid tracks (a fox or a local dog? ), rabbit, and grouse tracks. We first went north and visited the dam at the northeast side of the property. Beaver dam in February 2019 at Lone Pine Marsh. On the north side of the dam, we saw an interesting fuzzy blob attached to a sapling nearby which was later identified as a cecropia moth pupa. The beavers appeared to be constructing a dam a few metres north of the human dam. Pupa of Hyalophora cecropia found on a sapling at Lone Pine Marsh. We then walked south, into the small birch forest. There, beavers have been cutting many trees and a number have fallen over the path. We also saw grouse tracks in the snow. Members in the birch grove at Lone Pine Marsh. The sun came out for our walk and we all enjoyed getting out and visiting the Lone Pine Marsh this morning! It had seemed that winter had concluded but we received fresh snow and rain before the introduction walk at the McColl tract on April 21 making conditions challenging for a hike through our newest property. At least 21 intrepid friends and members arrived in the morning and walked the perimeter of the property. We visited the various tree plantations on the property as well as the hilly hardwood forest. We even made it down to the north edge of Cold Creek and stood in the springtime sun. Trails have not been fully established on the property which added to the footing challenges. Our property stewards are working to define a path which will enable us to monitor the property for invasive species. Collecting sap at the Wilkinson Tract. Pouring maple sap at Wilkinson Tract. It was a crisp but sunny morning on March 24 when members congregated at the Wilkinson Tract. Maple sap was just starting to flow well after a cool week of weather. We assisted Helmut and Janice Enns, who make maple syrup at the Wilkinson Tract, collect syrup from about 40 taps around the property. Helmut tends the sap pans at the Wilkinson Tract. After collecting sap, we tasted the various concentrations of boiling sap from the stove. Tasting maple sap with Helmut at the Wilkinson Tract. Donor George Wilkinson joined us around the fire and some non-members also came to learn more about the creation of maple syrup. It was a wonderful start to spring! Outside the sugar shack at the Wilkinson Tract. 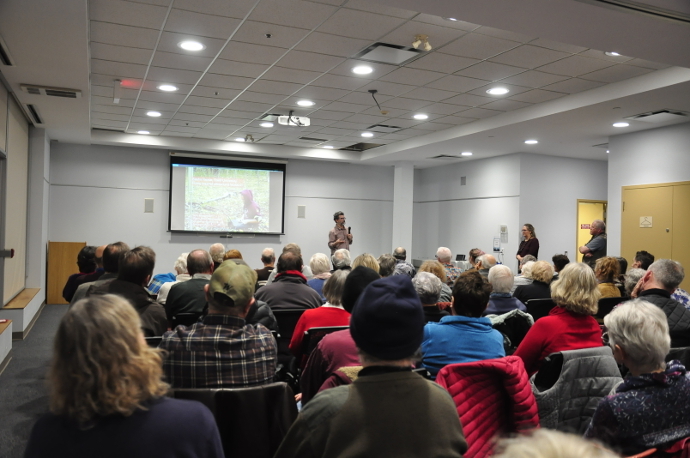 On February 15, Jeff Bowman, professor at Trent University and scientist at the Ontario Ministry of Natural Resources and Forestry, presented to a packed house (72 people) at the Cobourg Public Library (Northumberland Land Trust and Lone Pine Land Trust organized this event). Dr. Bowman began his talk by showing the relationship of flying squirrels to squirrels common in North America – they are closely related. Two species of flying squirrels are found in North America, the northern flying squirrel (Glaucomys sabrinus) and the southern flying squirrel (Glaucomys volans). Both of the species are found in Ontario, though the southern flying squirrel is limited by cold temperatures in the middle of winter. The northern flying squirrel is found in coniferous forests, while the southern flying squirrel prefers deciduous forests. Where populations overlap, Dr. Bowman’s research group has found that the two species can hybridize. This may be due to the southern flying squirrel’s winter nesting behaviour, as they prefer to nest with other individuals (presumably to keep warmer). Dr. Bowman showed how the research team monitors a population of flying squirrels at the James McLean Oliver Ecological Centre research station (using PIT tags and small radio collars). These techniques have allowed the group to examine nesting and caching behaviours of the squirrels. He also touched on other interesting aspects of flying squirrels, such as their ultrasonic vocalizations. Dr. Bowman answered the audience’s questions following the presentation. Comments by the audience were very positive and we all felt that we had learned a great deal about about these elusive creatures. For more information, visit the Flying Squirrel Project. Our final field trip was a lovely fall colour walk at the Munn tract near Codrington on October 14. The warm autumn had kept some tree species from fully turning but the gorgeous ravine woods was still stunning with lots of yellow, orange and a bit of red. There are many species of trees in this woods – American and Blue Beech, Eastern Hemlock, Bitternut Hickory, Red Oak to name a few – which allowed for a nice identification workshop and discussion regarding forest management issues. Blue Jays, Common Raven and Golden-crowned Kinglets were seen, as well as a few Red-backed Salamanders under rotting logs and the usual collection of Eastern Chipmunks gathering the abundant acorns. In some of the conifer plantations we saw the bank of native tree seedlings waiting on the forest floor to form the next generation of forest, once a scheduled thinning takes place in several years. In the Norway Spruce plantation near the road Red Squirrels have been busy hoarding large numbers of cones in piles for the winter.